The good: It's really difficult to find a book that can tackle a bunch of different elements and make them work in a cohesive manner. Usually I find myself thinking the author should've picked one or two themes to focus on but somehow, Jenny B. Jones truly made it work. Honestly this book has a lot going on. Celebrities, travel, death, grief, religion, bullies, family, romance, music.. I could keep going but I might accidentally spoil something. Looking at that list - it's easy to think, okay how can you possibly make ALL of that work in one book. But I swear, it does! Finley Sinclair lost her older brother, Will, a few years ago in a terrible tragedy and she's been unable to cope with the grief since then. She decides that the "cure" is to study abroad in Ireland just like he did at her age (and in the exact same town) and to audition for the Manhattan music conservatory with an audition piece she's written about him. The problem is - she can't write the ending. She thinks that if she goes to Ireland, using Will's journal as a guide, she'll find the ending somehow. So, how do the rest of the things I mentioned earlier fit in? Well, on the plane ride to Ireland she gets seated next to the hottest teen celebrity, Beckett Rush, who's filming his latest vampire movie. (Which she mocks at every possible moment - loved that!) They immediately antagonize each other. Or rather, Beckett immediately tries to charm her and she is having none of that. Every time she shut him down and he responded with a smile or smirk, I could help but giggle and melt a little. Girl, I don't know how you resisted him for so long. But that was part of the beauty of the book - watching their relationship slowly unfold. And yet, that didn't feel like the focus. 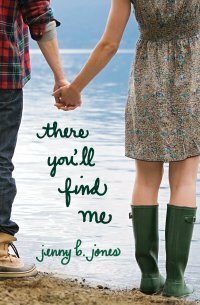 More than anything, Finley is searching for her brother and God in Ireland. She wants answers. She wants to feel happy. She wants control. But as expected, Finely begins to crumble under the pressure she's placed on herself and her grief starts to present itself in unhealthy ways. It's obvious every day is a struggle to be happy and let people in and I felt for her deeply with each passing page. (Potential) reservations: It is a religious heavy book and Finley prays often so if that's a turn-off for you, this may not be for you. Do I recommend? : I didn't expect to get so emotional while reading this book but I did. It's wonderfully written and I highly recommend it. I think I tried reading a "religious" contemporary book YEARS ago and just couldn't do it. However, this one sounds really cute and I wonder if, now that I'm older, I'd be okay with it! Great review; I'm glad this one pleasantly surprised you! I really should read this book, as I've had it for a year now! It sounds pretty great, and I LOVE the fact that it's set in Ireland. There's something magical about that place - and I've always wanted to visit!